Since returning to this country and to Newcastle, I have often pondered upon the possibility that I might meet my Chillingham Road Junior-School teacher, Winifred Findlay; little did I realise that she has been present at many of the HHG lectures over this last year. However, while she hasn’t changed a bit, I have changed considerably in the last fifty years – and because I am unable to recognise faces, we never made the connection. I have maintained, or revived, association with a handful of alumni, and they all said the same thing: “Wish we could get to meet her again – but I don’t know where she is.” Win had taught us during our final two years in junior school before many of us went our separate ways; yet her influence was one thing we all agreed upon in later years: that it had been the finest ingredient in our young education. Then, earlier this year, HHG secretary, Chris Jackson, was reading some autobiographical writings of mine and came across my mention of Miss Findlay, and how profoundly positive her influence had been on my young self. Chris said that there was an HHG member called Win Findlay – could this be her? 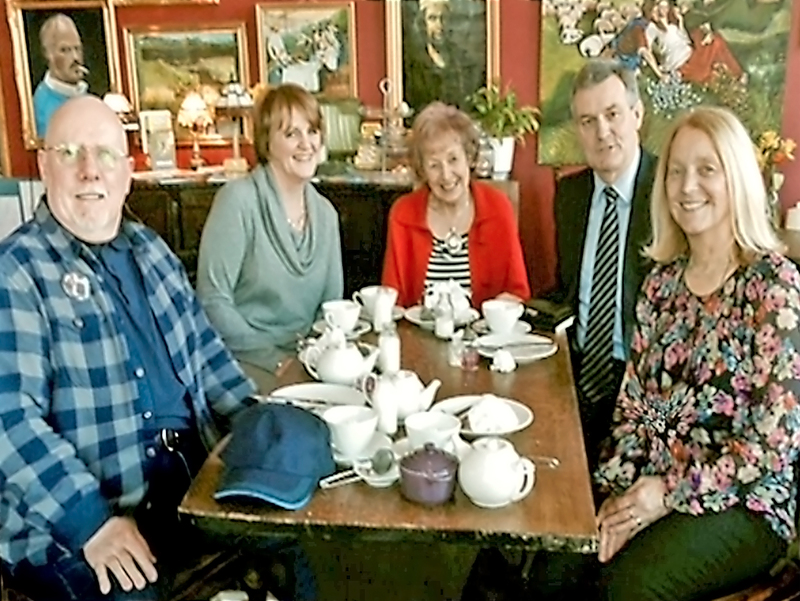 So, lo and behold, the connection was made and a reunion with said alumni and our Miss Findlay was arranged over afternoon tea at the Wild Trapeze café in Heaton this April past; considering all of us kids lived within spitting distance of the Co-op, it seemed perfectly apposite. Finally, we got to meet her and to let her know just how profoundly she had affected us, and how much we had always appreciated her teachings during the subsequent course of our lives. 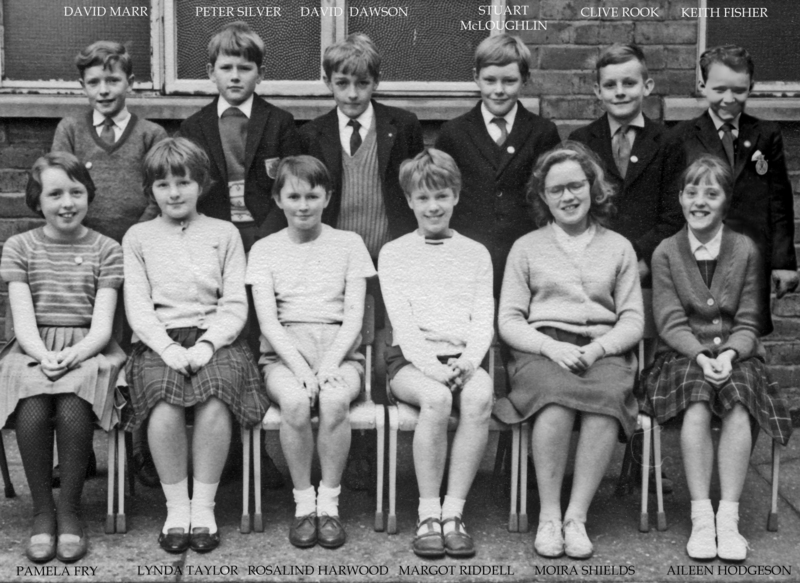 I sent a copy of the reunion photo to a close friend and fellow pupil who now lives in Jersey, and he responded by telling me that if he had known of the reunion he would have come up for it. So I’m going to track down a few more alumni and organise a second get-together, because I am quite certain they will all be of a similar cast of mind where Miss Findlay is concerned. Win Findlay: “Thank-you Heaton History Group for your role in our reunion. It was a delight to meet up with treasured “old friends” and be reminded that we are all part of each others’ rich history. Their generosity and, undeserved, comments are most humbling, but gratefully received. I shall place the memory of our reunion and all we learn together at the top of my affectionate memories of “these I have loved”. Were you in the class of ’64? The group now hopes, with the permission of individuals, to circulate amongst members (only) a list of names (without addresses etc) that would allow anyone who spotted someone with whom they might like to meet up with again, to make contact via the secretary. Watch this space. This entry was posted in Events and tagged Chillingham Road School, Co-op, Wild Trapeze, Win Findlay on May 31, 2015 by oldheaton.